A few weeks ago I made some excellent cast-iron skillet cornbread. While that recipe is my new favorite “regular” version, I also like making it sweet. This recipe is Fuzz’s favorite. You can incorporate it into any meal, but with its sweetness I think it’s especially good for breakfast served with a little bacon or the leaner choice, turkey sausage. The recipe is adapted from an old classic by Betty Crocker, but over the years I’ve changed it up a bit by swapping out some of the sugar for honey and reducing the butter. The last time I made it I used I Can’t Believe It’s Not Butter spread, but you can use regular salted butter. If you use unsalted, add an extra pinch of salt to make up for what’s in the spread. I think you’ll like this one given that it is a little bit healthier, but if you want a recipe that’s really rich and indulgent, try Ina Garten’s Corn Muffin recipe. Preheat oven to 400 degrees F. Rub a 9 inch round cake pan generously with butter or spread. In a bowl, mix together flour, cornmeal, salt and baking powder. Set aside. In a mixing bowl, whisk together melted butter, honey, sugar and egg, then whisk in the milk. Stir in the flour mixture into the milk mixture gently. Batter should be slightly lumpy. Don’t over-beat. Pour into greased pan and bake for 20-25 minutes at 400 F.
Martha, I think most all buttermilk is low fat, but if you know of a type that’s very low fat or fat free, then I’m sure it would work. I love cornbread made in a cast iron pan. Have you ever tried it with lowfat buttermilk? 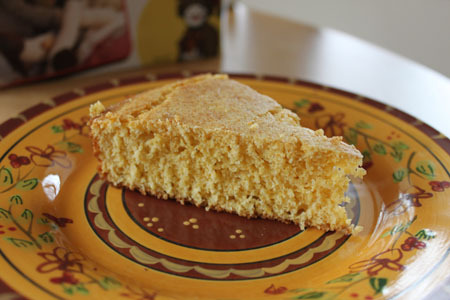 Love simple and sweet cornbread like this! This recipe looks easy and delicious. I don’t know why I’ve always used Marie Callender’s Cornbread mix when homemade cornbread does not appear to be difficult to prepare. I’ll definitely try making it from scratch next time. I made the cast iron skillet cornbread two nights ago and thought it was great! I think I’d love this recipe for breakfast with a little maple syrup! Sweet cornbread is the best! I am about to post a recipe I made that used maple syrup as the sweetener. What a delicious way to make corn bread. love that it’s healthy too!